EnBW will develop the 900MW He Dreiht site in the North Sea without federal support, meaning the project will only receive the market price for electricity. Two of Dong's approved projects will also be subsidy-free; the 240MW OWP West and 240MW Borkum Riffgrund West 2 projects. Dong's third project, the 110MW Gode Wind 3 site, will receive €60/MWh support. All the projects are expected to be completed by the mid-2020s, subject to final investment decisions. EnBW currently operates 336MW of offshore wind in Germany, with a further 610MW due online by the end of 2019. "Our bid demonstrates that integrating offshore technology into the market by the middle of the next decade is possible, and that offshore wind energy can make a significant contribution towards Germany meeting its energy and climate policy targets," said EnBW CEO Frank Mastiaux. "Following on from very good energy yields, offshore technology has also made a quantum leap in terms of efficiency to now qualify as a true driver of the German Energiewende. "He Dreiht thus demonstrates our clear commitment to the further responsible and cost-efficient expansion of offshore wind energy and symbolises our contribution to the Energiewende," Mastiaux added. Offshore wind's leading developer Dong said the zero-subsidy contract is a breakthrough moment for the industry. "It demonstrates the technology's massive global growth potential as a cornerstone in the economically viable shift to green energy systems," said CEO Samuel Leupold. "Still, it's important to note that the zero bid is enabled by a number of circumstances in this auction. "Most notably, the realisation window is extended to 2024. This allows developers to apply the next generation turbine technology, which will support a major step down in costs. "Also, the bid reflects the fact that grid connection is not included," Leupold added. Dong said by the 2024 deadline, turbines of between 13-15MW capacity could be available. The developer also plans to combine the OWP West and Borkum Riffgrund West 2 sites into one major project, to cut costs. Grid operator Tennet will be responsible for supplying all the projects' grid connections. 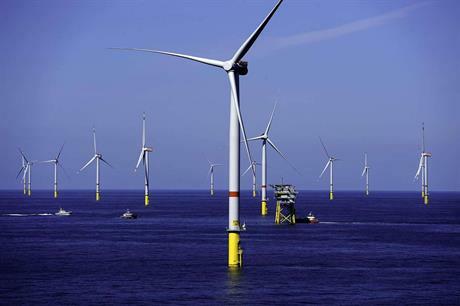 WindEurope CEO Giles Dickson said the results show "offshore wind is now on a par with conventional power generation". BWE president Hermann Albers is remaining more cautious over the new scheme. "The reliable instrument of the EEG is being exchanged for a highly speculative instrument. Medium-sized enterprises and companies that are not protected by state ownership structures will not be able to act as highly speculative," Hermann Albers said.